I officially have a very complicated and confusing relationship with Vampironica. I have given very poor reviews to a few of it’s issues and I stand by each of those reviews and I have given semi-positive reviews to a couple of it’s issues as well. This five-issue mini-series has made me so confused about how I feel about it with each issue’s release. I was pretty rough on Vampironica #4 and it’s boring and unnecessary build-up to this finale. But here, in Vampironica #5, we have the actual big finale, the end of the mini-series. To wrap up the series, I basically went back and forth loving and hating this five issue, similar to how I felt with all of the previous four issues combined. The entire sequence of Veronica going through hallucinations of her fears was great and one of the best things about this entire series. These scenes were creepy and unsettling, which was perfectly executed thanks to Greg Scott’s artwork. As great as this first half of the issue was, the climax of this final issue is quite disappointing and the happy ending is unsatisfying. It is almost as if they had some great ideas with this labyrinth that Veronica goes through and then realized they can only write 22 pages so they had to rush a bad ending. This is a perfect example of how this entire series has played out. 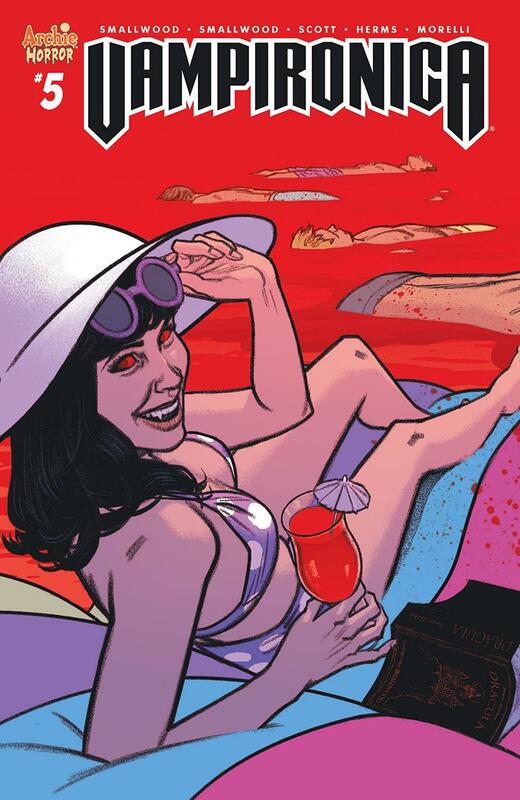 So once again, Vampironica falls short of it’s potential and delivers a mediocre horror comic book. It was so close to being a fantastic issue, but my faith in Vampironica evaporated when I realized that this series is simply just a weak horror series.